John and I decided to try Stikliu alude out for lunch, which proved to be a great choice. 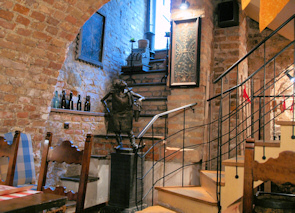 The restaurant is located in the heart of the Vilnius Old Town, the former Jewish trade quarter. 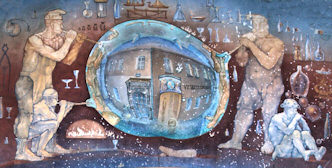 The restaurant takes its name from Stikliai Street, on which artisan glass blowers kept their shops in the medieval times. (Stikliai in Lithuanian means glass blowers). On the same street you will find Stikliai hotel, internationally acclaimed Stikliai restaurant which serves high quality international and Mediterranean cuisine and Stikliai beer cellar Stikliu alude, which offers more traditional fare for almost a third of the price. In the past Stikliu Alude used to be an old tavern. It was tastefully restored to create a sense of medieval Lithuania. 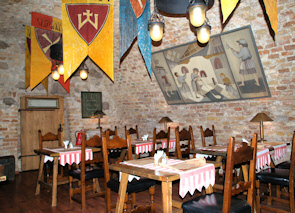 We went to sit in a cosy dining room downstairs,in a brightly vaulted cellar;decorated with the antiques and colourful ancient flags with the names of Lithuanian dukes, the cellar provides an ambiance of the romantic past. The atmosphere of this Vilnius restaurant is informal and laid back. They were playing accordion in the background, at a very comfortable level for conversation, which made the meal even more pleasant and cheerful. We found out that they offer live folk music shows and dances from Wednesday to Sunday. The restaurant presents Lithuanian food in a more classy way. You can try potato pancakes with salmon or jacked potatoes with hearing. You can also ask for the European dishes: such as Greek salad or spicy mutton soup. These dishes go very well with all sorts of Lithuanian beers; with the oldest beer among them, produced since 1686, which was apparently to the taste of both nobles and peasants. However, I have to mention that we had to wait patiently for our meal to arrive, even though the restaurant was pretty quiet at that time of the day. Fortunately, the atmosphere was lovely and we had plenty of spare time. The food was worth waiting for. 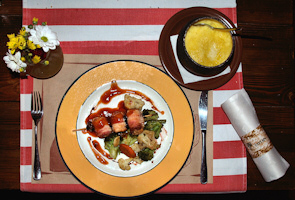 From the way our meals were presented, it was obvious they pay a lot of attention to detail when serving the food. Some of the dishes came in old-fashioned pots and mugs. John went for chicken rolls wrapped in thin slices of bacon grilled on a skewer (9 €). Not usually a fan of anything wrapped in bacon, he did enjoy the mixture of subtle flavours of this particular meal garnished with special sauces.